Chris Brennemann has taught at Hannibal-LaGrange University for over twelve years and is rewarded and challenged by the energy and teachable, dynamic spirit of college students. Brennemann is adamant about her calling and commitment to hands-on, practical instruction. She explains, “The communication industry is ever-changing, evolving into greater outreach, more powerful influence and impressive creative and technical aspects. The list of career opportunities is expanding more in this field than in most other academic areas.” Brennemann teaches in all the Communication Studies areas of speech, public relations, journalism and audio/video production. Brennemann serves on the Student Learning Improvement and Academic Department Review committees at HLGU. She works closely with production and live coverage of HLGU special events including athletics. Brennemann is working on the dissertation phase of earning her PhD in Communication from Regent University. She finds the integration of faith and learning engaging and stimulating as she prepares Public Relations and Media Communication students to use their foundations and skills in the workplace and in their areas of interest and service. 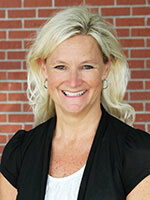 Brennemann’s free time is absorbed mostly with activities and sporting events with her family. The Brennemanns are active members of First Baptist Church in Palmyra.